Our removal guides reads shows how victims can recover their computers from the Wana Decrypt0r Trojan-Syria Editi0n ransomware and recover .wannacry files. How Does Wana Decrypt0r Trojan-Syria Editi0n ransomware Infiltrate the System? The first Wana Decrypt0r Trojan-Syria Editi0n ransomware samples were identified in June 2017 targetting computer users worldwide. The low volume of acquired viruses does not indicate the primary infection strategy. Email spam messages can carry the Wana Decrypt0r Trojan-Syria Editi0n ransomware in social engineering. The virus can be attached directly to the campaigns or linked in the body contents. The hackers use different templates to make emails that pose as legitimate companies or institutions. Infected documents and software installers are also utilized by the hackers. This is done by integrating scripts that download the ransomware from a remote server. This type of infections cannot be detected by some of the simpler anti-virus products, this is why we recommend that all computer users employ a quality anti-spyware solution to protect themselves from all types of infections. Browser hijackers amd other malicious add-ons can be hosted on hacker-controlled download portals and sites. Other “helpers” include web scripts, ad networks and redirects. 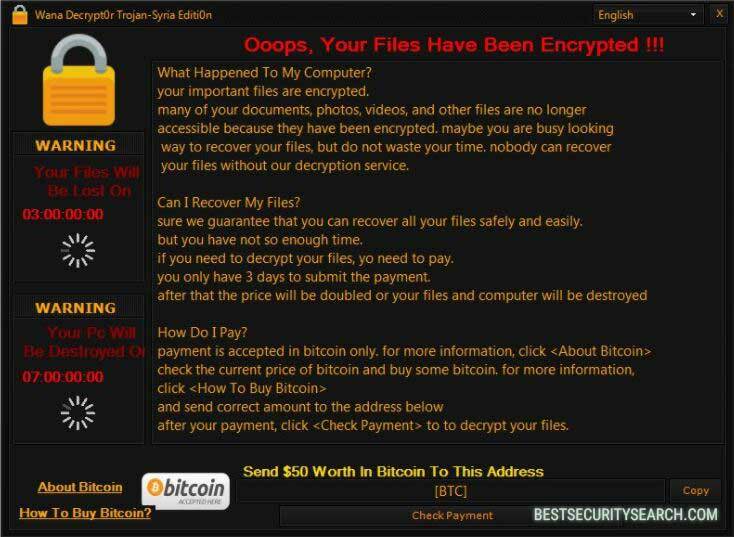 Security researchers discovered a new virus that imitates the famous WannaCry virus that caused major infections and mayhem last month. It is called the Wana Decrypt0r Trojan-Syria Editi0n ransomware and it is not related to it. Its virus engine code is sourced from the famous Hidden Tear that has laid the foundations of many imitator viruses. The captured samples of the Wana Decrypt0r Trojan-Syria Editi0n virus seem to be still in development. They are relatively few in comparison to other virus attacks and contain only a basic encryption engine. Depending on the acquired sample it may not encrypt files at all or only a limited set of the full list of target file type extensions. Most similar threats typically seek to process as many system and user data as possible including documents, archives, backups, photos, videos, configuration files and etc. If the victims acquire a Wana Decrypt0r Trojan-Syria Editi0n ransomware sample then the encryption engine is automatically started. Depending on the hacker configuration it may follow a set of standard extensions or a partial list. Once this process is complete the .wannacry extension is used to mark the affected files. Ooops, Your Files Have Been Encrypted !!! your files without our decryption service. sure we guarantee that you can recover all your files safely and easily. if you need to decrypt your files, yo need to pay. you only have 3 days to submit the payment. after your payment, click to to decrypt your files. The criminals extort the victims into paying them a ransom fee of 50 US dollars in the Bitcoin digital currency. The currently available samples do not indicate a payment gateway created by the hackers. The victims are provided only with an address where the money is to be sent. WARNING! Manual removal of Wana Decrypt0r Trojan-Syria Editi0n ransomware requires being familiar with system files and registries. Removing important data accidentally can lead to permanent system damage. If you don’t feel comfortable with manual instructions, download a powerful anti-malware tool that will scan your system for malware and clean it safely for you. WARNING! All files and objects associated with Wana Decrypt0r Trojan-Syria Editi0n ransomware should be removed from the infected PC before any data recovery attempts. Otherwise the virus may encrypt restored files. Furthermore, a backup of all encrypted files stored on external media is highly recommendable.